For years, from Benkler to Shirky, we’ve been declaring an end to media monopolies thanks to networked communities that no longer require institutional intermediaries to share, collaborate or take collective action. This ability (and motivation) to produce and use media for almost free threatened the very economic model that media moguls had taken the bank for over a century. As I made my own transition from corporate media journalist to independent content creator, I took advantage of new, inexpensive tools that we saw as the great democratizer of production. Was Steve Jobs more Anakin (good guy corrupted by power into Darth Vader) than Luke Skywalker all along? The guy who gave us the signature 1984 Superbowl commercial of a single woman taking a sledgehammer to tyranny, now sitting on Disney’s board, a hawker of music, TV shows, movies, all wrapped up neatly (and Flash-free) behind iTunes? Judging from the heated conversation surrounding the iPad, some feel betrayed, others say this is a natural next step in media technology that will set us free. Without a camera, or a USB port (unless you buy Apple’s proprietary dongle accessory), the iPad is purely intended as a media consumption device. There’s nothing wrong about that, and many media companies (from publishers to newspapers) see salvation in a portable device that serves as a safe, monetizable conduit to their content. The geek elite has focused primarily on how Apple has not enabled the iPad for Adobe’s near ubiquitous Flash multimedia platform. For now, that means no YouTube or Hulu — competitors to iTunes. Some say this isn’t such a bad thing, as Apple favors what it sees as the more open HTML5, and that Flash is on its way out anyway. Web Dude Robert Scoble himself stirred the pot (read the great comments!) with Can Flash Be Saved? I see Steve Jobs as more of a Han Solo figure. You’re pretty sure he’s fighting for the rebel alliance, but sometimes he’s such a maverick that you’re not sure if he as any allegiances at all. Bill Gates, of course, is Emperor Palpatine–for many years the supreme ruler of the Dark Side, but whose empire is starting to crumble under the attacks of a bunch of idealistic rebels. Larry and Sergey are Luke and Leia. Their midi-chlorian counts are through the roof–but nobody knows, so far, whether they’ll give in to the dark side. Vint Cerf, I’m pretty sure, is Darth Vader. Jeff Bezos may well be Boba Fett. Like Lucas, Jobs and Apple have moved from innovators of technology to corporate money making machines. 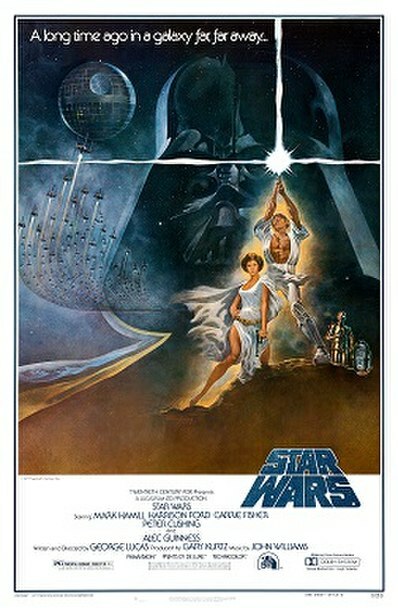 In the beginning, Lucas used technology to advance film making and story telling. His independence allowed him to take chances and he created a trilogy of films and new technologies that have advanced film making to new heights. Jobs and Woz developed new technology that has served to make the computer experience more user friendly and keep Microsoft on their toes. But now as the success of iPods and Macs have served to lessen the threat of Microsoft a new Vader has emerged.